printing and dyeing. 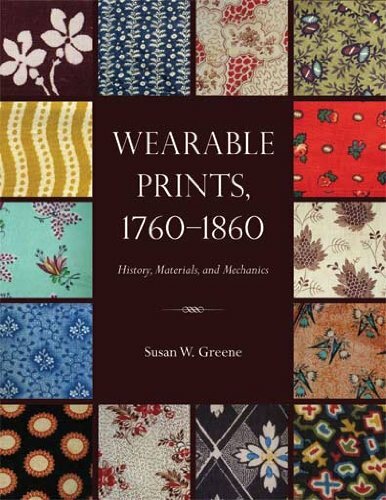 Greene brings together evidence from period publications and manuscripts, extant period garments and quilts, and scholarship on eighteenth- and nineteenth-century chemistry and technology. Making the text come alive, Greene includes some 1600 full-color images, including a plentiful array of textile samples. Wearable Prints, 1760-1860 is a convenient encyclopedic guide, written in plain language accessible to even the most casual reader. Historians, students, costumers, quilters, designers, curators, and collectors will find it an essential resource. Kent State University Press has won the 2015 PROSE award in the category of Single Volume/Humanities and Social Sciences for excellence in publishing–with Wearable Prints 1760-1860! Each year, publishers and authors are recognized at the PSP Annual Conference in Washington, D.C., for their commitment to pioneering works of research and for contributing to the conception, production, and design of landmark works in their fields.